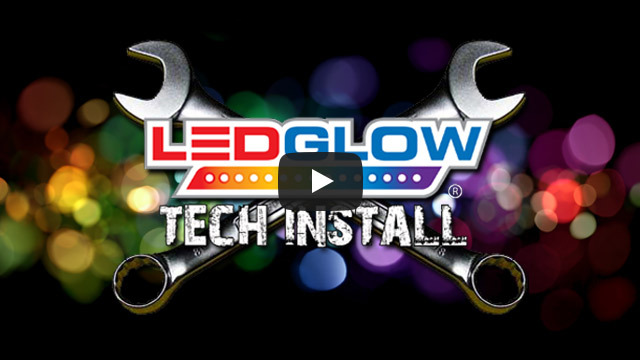 LEDGlow’s Advanced Million Color Pod Lighting Kit features 3 ultra-bright RGB SMD LEDs per pod light that create a custom multi-color accent lighting to your motorcycle or ATV with multiple lighting effects. LEDGlow's Advanced Million Color SMD LED Pod Lighting Kits add custom multi-color accent lighting to your motorcycle or ATV at an affordable price. Each pod features 3 SMD LEDs that allow for a more low profile pod that is only .30" thick, as well as adding crisp and vibrant colors to your bike. Each pod features a modular connector that lets you power this kit with LEDGlow's slim and easy to hide Advanced Million Color Control Box by simply connecting it to any 12 volt power source. Each waterproof LED pod includes 3' of power wire, 3M tape, and mounting screws for a quick and easy install. LEDGlow includes a one year limited warranty and free technical support with every Million Color SMD LED Pod Lighting Kit. LEDGlow’s Advanced Million Control Box features 15 solid colors such as Blue, Red, Green, Purple, Yellow, Teal, White, Orange, Pink and more, as well as 2 color cycle modes, 3 flashing patterns and 1 fading mode. All of the control box's featured colors and lighting patterns are easily selected by utilizing the included 4 button wireless remote. Each pod light is easily connected to the control box with the included power wire harness through modular connections. Put them on a Honda 3 wheeler and they are super bright and look amazing!!!! !